Read the full study or HER Foundation collaborative research. This entry was posted in Uncategorized by Kimber MacGibbon. Bookmark the permalink. 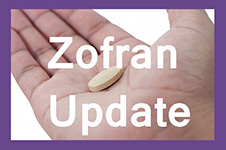 Regarding the study about zofran and birth defects: in what pregnancy weeks did the pregnant women take the medication? I saw a statement on DrugWatch which stared that e.g. the Danish study result was not to be trusted since all women included in the study took the drug after w10, and therefore were outside the window for the development of birth defects. I am on my 8th pregnancy week, and this is my 3rd pregnancy with HG. It gets worse every time. I have previously been on prometazin (antihistamine), but I only found help from it during my first pregnancy. No other medicine has worked fo me. My doctor prescribed me ondansetron but I am really scare to start taking it. At the same time I am in a really poor way, and vomit 15-30times a day.